Our prayer warriors are required to profess salvation being filled with the Holy Ghost. They watch unto prayer taking advantage of individual prayers, group prayer, corporate prayer and intercessory prayer. Following the guidelines below will make you an effective prayer warrior. 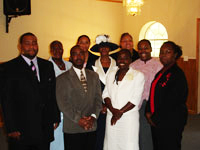 This group, led by Bernice Hill, travels with their pastor for spiritual support.